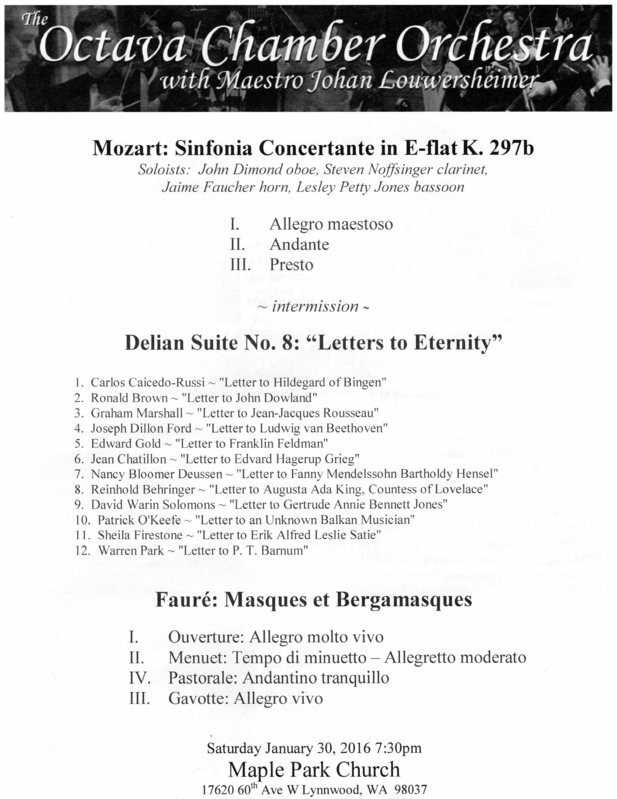 1) Letter to PT Barnham The Delian Society (the on-line tonal composers club I belong to), for it's Delian Society Suite #8, Letters to Eternity (2015) project, asked composers to provide musical letters to anyone they chose from the past, known or unknown. 12 composers responded with very individualized 'letters', written with the instrumentation found in the Octava Chamber Orchestra of Seattle, who agreed to partner with the Delian Society on this project. The performance took place on January 30th, 2016. Here is the program from that concert, and here is the link for the recording of all 12 short pieces. I chose PT Barnham, Circus Showman, as the subject of my letter. My piece features some familiar tunes that sometimes are found in the music played during circus performances, complete with a few crowd vocalizations produced by the musicians. 2) Snowbound piano solo The Eclectic Edge Ensemble and Mad Munchkins Productions produced an amazing new revision of their five-year-old Snowbound show, with quite a bit of added material, dance, puppetry and music. This piece for solo piano accompanies specific stage action that involves a pair of brand new characters whom the main dancers in the show 'create' as part of the story. The personalities of the two characters are reprised during this six-minute piano solo, written for this entirely new section of Snowbound. Four performances of the new Snowbound show took place at the Lab Theater in Minneapolis, in mid-March, 2016. 3) The Green Laughter of Spring This is a revised choral work based on the original 20-year-old piece written for the First Universalist Church Choir. This new version has never been performed before. The music is setting a poem by First Universalist Church of Minneapolis' retired minister, Rev. John Cummins. This music was performed during the church services on May 8, 2016. 4) Fantasia for Seven Players This is actually a piece written in 1978, and recorded at a public performance by capable musicians as part of a West Bank School of Music concert. It is a live recording, complete with the coughs from the audience, some missed notes, a few spots where the players are a little out of synch, and the noise of a trombone mute falling to the floor. Fantasia was written specially as a companion, 'warm-up' piece for Stravinsky's Soldier's Tale, using the same exact instrumentation: violin, double bass, trumpet, trombone, clarinet, bassoon and percussion. The performance is exciting and enthusiastic, even with its flaws. This recording was recently retrieved from an old reel-to-reel recording made in 1978. This composition is being revised and soon will be available in print quality score and parts.  Specialized small scale music services for individual composers, songwriters and musicians, including computer music engraving, sheet music production and binding (including VPC Music Master), performance lead sheets, performers' instrumental parts, work with sound files, computer score editing, demo CD burning and much more.  Original musical compositions by Warren Park for small instrumental ensembles, choral groups and solo piano.  New commissions, arrangements; music designed for specific uses and occasions, commercials, theatrical productions and film & video.